It's almost been a year since Tom Ford released the Private Blend Les Extraits Verts collection; two of the fragrances — Vert Bohème1 and Vert de Fleur2 — have finally come within smelling distance so here goes. Vert Bohème begins with a blast of rich galbanum (if you don't like galbanum, no need to search out Vert Bohème). Joining the galbanum is a cool, almost mentholated citrus peel aroma and "green" flowers. I can't detect magnolia but there is honeysuckle in Vert Bohème, mixing with some soft violet leaf. As for the listed Gustavia superba, I have no idea what this glorious-looking flower smells like, but its mention in Tom Ford PR fueled my interest in smelling Vert Bohème...so it served a purpose (at least among the horticulture-curious). Vert Bohème quickly becomes a skin scent and turns a bit prim for my tastes; at the end of its development a hint of vetiver joins the lingering galbanum and there's also a quiet mossy/minty-herbal note. Apart from its galbanum (which smells natural), Vert Bohème's ingredients (their quality and quantity) don't smell like they justify its price. Next...! Vert de Fleur also starts with galbanum, this time fraternizing with a perfect accompaniment: hyacinth. Floral sweetness abounds in Vert de Fleur's opening and heart, hyacinth gives way to jasmine and jasmine to creamy rose. Then? Someone grabs this pretty bouquet right out of my hands and runs off...leaving a trail of tangy "grass"/moss, talc-y orris root (and maybe some vetiver) in the air. If you want to extend the floral opening, make sure you get Vert de Fleur on your clothing. Vert de Fleur's extreme dry down smells of floral musk (the white, not the green, variety). As I wore Vert de Fleur, a friend had the audacity to say to me: "You smell like a, uh (looooooooooooong silence), lady." I have taught her NEVER to call a fragrance an "old lady perfume" in my presence. She caught herself right when the word "old" was about to sprout from her lips. Vert de Fleur does smell feminine — and retro. After I applied a heavy dose before work, I regretted it all day; Vert de Fleur is too womanly for me. While smelling these two fragrances I don't know whether to think: "No more Verts for me!" or "Darn...I chose the two wrong Verts to try!" Do comment if you've smelled Vert d'Encens or Vert de Bois. 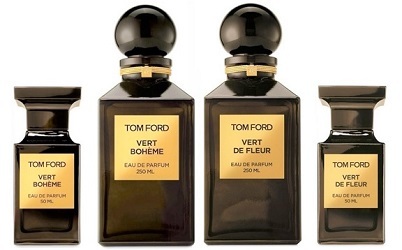 Tom Ford Vert Bohème and Vert de Fleur Eaux de Parfum are available in 50 ml ($225) and 250 ml ($595). 1. Listed notes of galbanum, mandarin, magnolia, honeysuckle, violet leaf, Gustavia superba. 2. Listed notes of galbanum, iris, hyacinth, neroli, bergamot, basil, jasmine, rose, orange blossom, vetiver, patchouli and oakmoss. 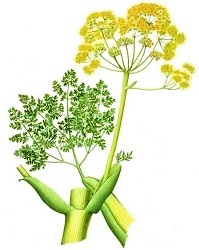 Note: top image of galbanum (altered) via Wikimedia Commons. I wish Sephora carried the full line so I could actually get samples! I will have to try both of these next time I near a Tom Ford counter in a big department store, I actually think I might like these too. CB, they have their fans for sure. I’m going to have to dig out the sample to see which it was! I think it was de Bois…. anyway, it smelled just like Plum Japonaise with a dark green top note. Fine but not exciting. I don’t hold my breath for Tom Ford. I tried on ‘Vert d’Encens’ – and in the following days I became obsessed. I then decided to get a full bottle. It’s just heavenly – the pine note is perfection – and it lasts an extremely long time on my skin. Kind of like the Private Blends used to. Very powerful stuff and so good. One of the most interesting Tom Ford scents in a long time. I’ve tried the other TF Verts but not Boheme or Fleur. I suspect you won’t find Encens or Bois womanly, or even particularly retro. Encens is just like it sounds–a pretty solid incense with a sort of piney quality (which frankincense kind of already has); I feel like the pine is amped up and extended throughout much of the perfume’s life. Vert de Bois just screams “Tom Ford” with its woodiness. To me, both of these were sort of forest-green, rather than grassy-green, if that makes sense. Lauren, yes…that makes perfect sense! That’s a great description to me. This is funny as I had an odd–for me–craving for ladylike scents this spring and fell in love with Bois de Fleurs. Fell in deep like might be more accurate, but I did buy a small bottle and wore it a lot this spring. Some of the other more demure perfumes I loved don’t have the lasting power that this one does. Naias, I am looking at you. Thanks as always, Kevin, for the great review. I can say that none of the other Verts did it for me. Not a Tom Ford fan, but I will say one thing for the line. A sales associate was showing me one of these and dropped the bottle on the hard tile floor. Chips flew — but it was the tile and the cap flying off. The bottle was unscathed, not even a corner chipped. THAT did impress me. Fortunately for her, although it was quite dramatic from my perspective, no one else paid any attention, and no one came to see what had happened. Bois got all the accolades and I like it but the Encens is my favorite, but then I am a sucker for incense fragrances.